THERE’S BEEN ANOTHER fire in my neighborhood, this one two blocks away instead of directly across the street. This time I didn’t race to the scene, allow I certainly could have. The contingent of fire and police vehicles, with sirens screaming, woke me with a jolt early this morning. Typically I don’t think much of sirens in the middle of the night. Living along a busy street, I hear them all too often. But when multiple emergency vehicles just keep racing by and sirens shut off near my home, I take note. So I pulled myself out of bed, grabbed my glasses, peered out the window, failed to see anything and slid back under the covers. At 1:19 a.m., when another fire truck—this time the ladder truck—roared past, I slipped barefoot out the front door, descended the steps to the end of the sidewalk and peered down the street toward emergency lights flashing in the blackness of the night. I couldn’t see flames, didn’t smell smoke. But, still, I pondered whether I should change into street clothes, grab my camera and go. I didn’t. While I’m a blogger, I’m no longer a newspaper reporter and photographer. My days of chasing fire trucks ended decades ago. Yet, that urge, that desire, that curiosity, remain. I crawled back into bed, wide awake, the adrenaline still pumping, wondering how my husband could seem so disinterested in the drama unfolding nearby. He’s calm like that and able to shut out distractions once his head hits the pillow. He wanted to sleep. Me? Surprisingly, I fell asleep relatively easily. But I slept fitfully, dreamed about firemen and police and a tarp covering bodies on a flat bed trailer. And when I awoke six hours later, contacted the editor of The Faribault Daily News about the fire and read the story posted online around noon, I was relieved to know that my nightmare was only that, a nightmare, with no truth to it. Click here to read The Daily News article. Then click here to read The Daily News article about a fire at the same house during the early morning hours of May 19. That first suspicious fire caused only minimal damage to the home, owned by Wells Fargo. Compare the two photos in the separate stories. You’ll see significantly more damage done during the second fire. It’s pretty clear to me that someone is determined to burn down this house. 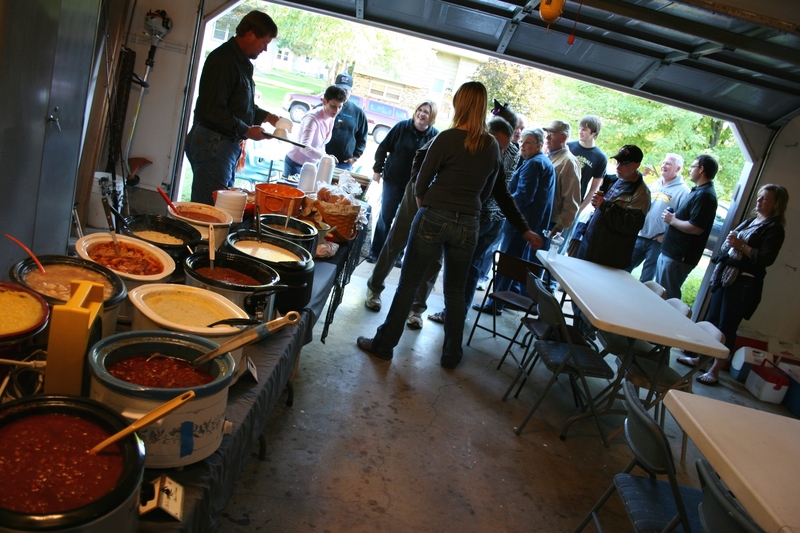 Guests gather inside and outside a Waseca garage for an autumn soup party. IT IS, FOR MY EXTENDED FAMILY, a rite of autumn in Minnesota. The orange tub of cheese balls. My nieces’ bloody finger cookies. Julie’s homemade breads, still warm from the oven. Vintage trays stacked high. 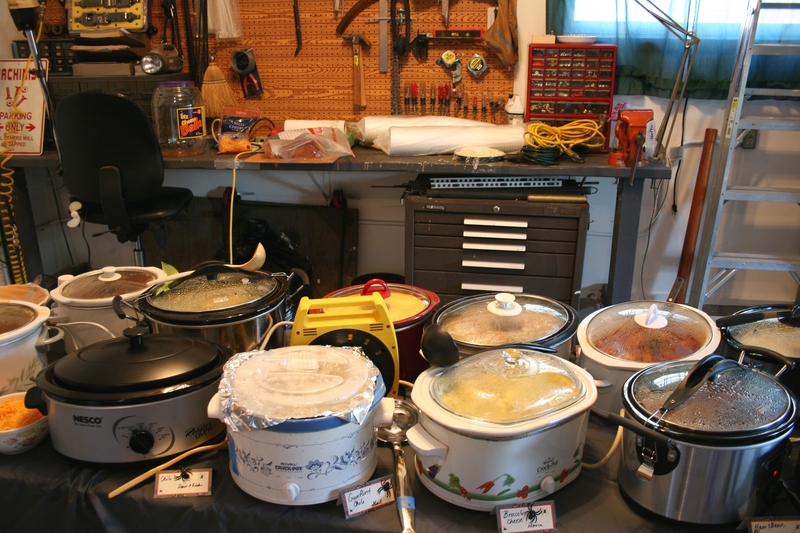 Crockpots, brimming with soup, crammed onto tables inside the garage. Sampling each soup or chili. And afterward, conversation and laughter around the backyard campfire. Last Saturday night my sister Lanae and her husband Dale hosted their eighth annual soup party at their Waseca home for family and friends. For me, and many others, it’s a must-attend autumn event. 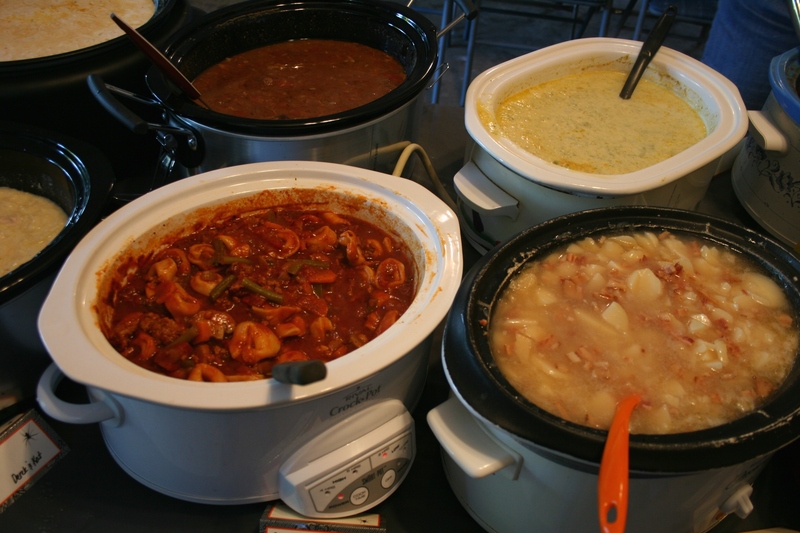 Tortellini with Italian Sausage Soup, left, and German Potato Salad and Creamy Corn with Jalapeno soups to the right in photo. 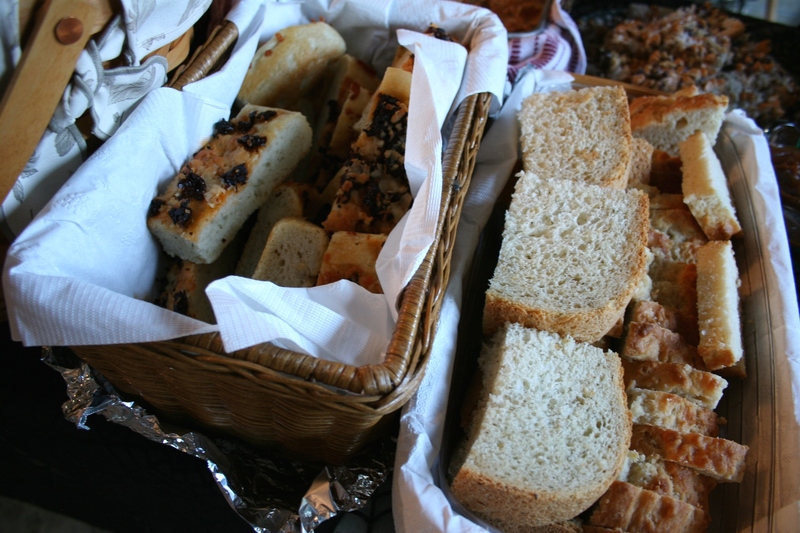 Homemade breads, this year crafted by Lanae and Dale's friends, Julie and Vicki. 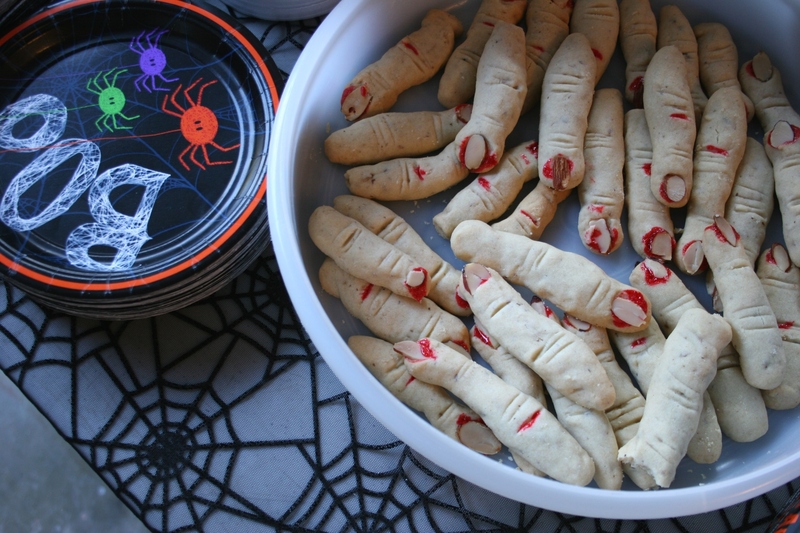 Bloody finger cookies, a soup party tradition. Sweatshirt weather on a day that transitions quickly from cool to cooler. Oranges and reds and yellows. Chili that bites and heats the innards. Comfort in the familiarity of Chicken Noodle Soup laced with thick, homemade noodles. Unfamiliarity in the Chinese Hot & Sour Soup among these mostly Germans more connected to the German Potato Salad Soup. Trying tofu for the first time in that tasty Chinese soup. Listening to my other sister share how her family detests the stench of the Broccoli Cheese Soup she brings every year. Trading left-overs with Carol, who raves about my Black Bean Pumpkin Soup, which I don’t find all that great. I think I’m the winner, getting her Chicken Noodle Soup. Carols thinks she’s gotten the better end of the swap. It is a matter of opinion, a matter of taste preferences. 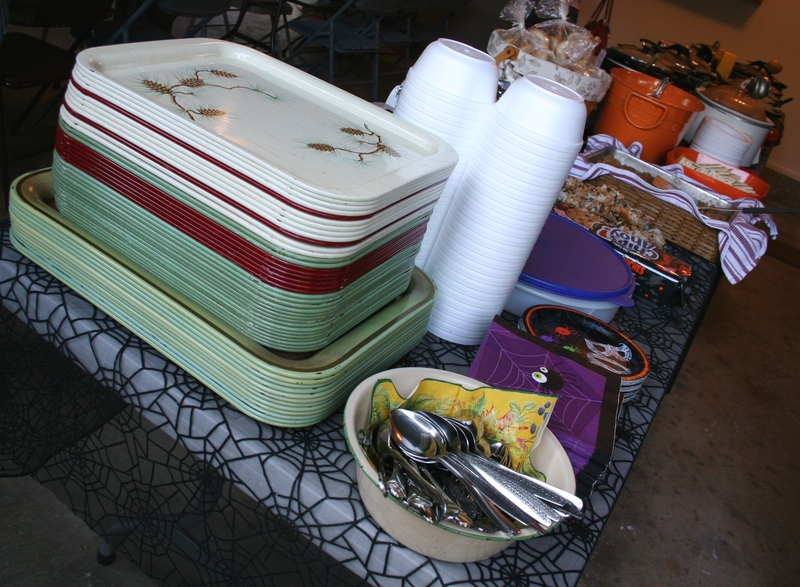 Crocks of soups and chilis are set up on tables inside the garage. Vintage metal trays provide the perfect place to set bowls of soup/chili and other food. 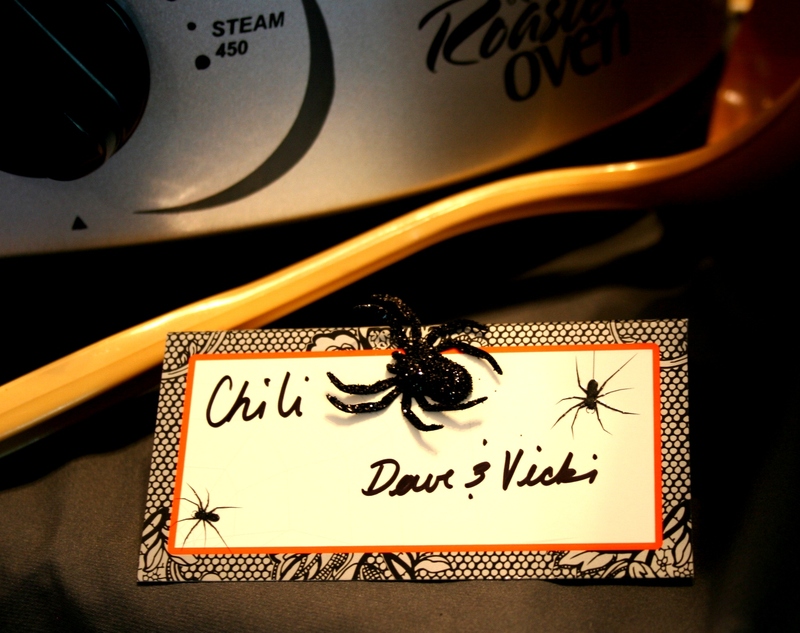 Before the party, guests tell my sister what soup/chili they are bringing so she has labels ready to mark each soup on party night. But we arrive expecting to enjoy ourselves in the company of family and friends on a beautiful autumn evening in Minnesota. And we do. And I did. 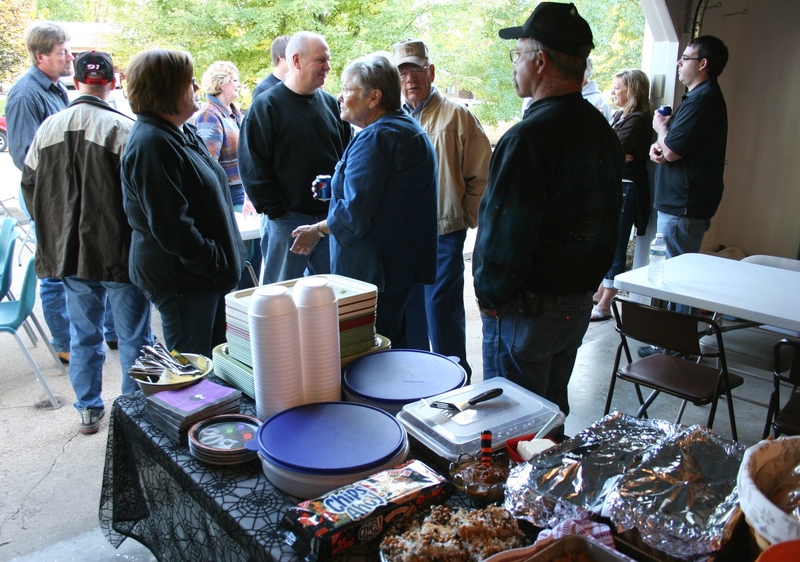 Soups/chilis are uncovered and party-goers start lining up to sample the offerings. THANKS, LANAE AND DALE, for hosting this fun, tasty event. WEST WOULD BE my destination of choice this weekend. Not west as in West. 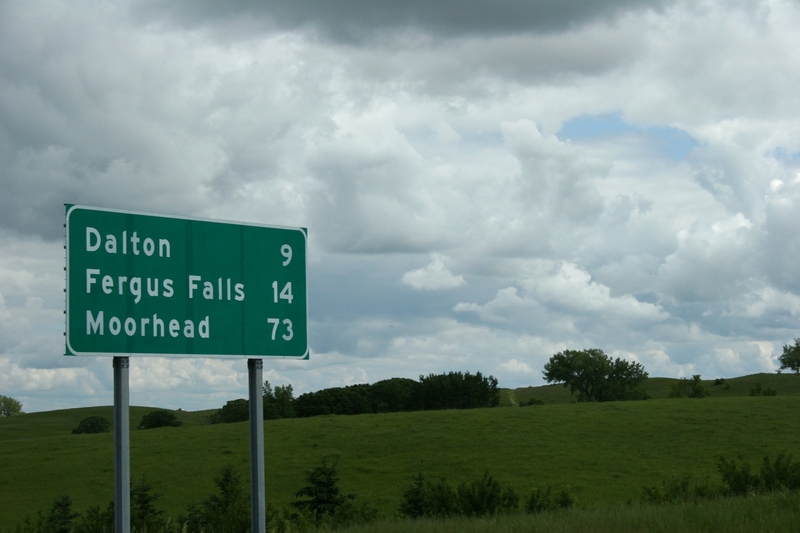 But west as in Fergus Falls or the Upper Minnesota River Valley. 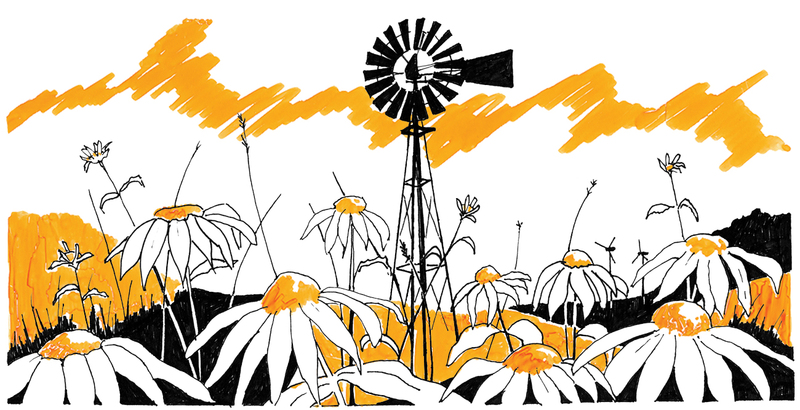 Two arts events in western Minnesota this weekend will take you nearly into the Dakotas. I’d like to be at the Lake Region Writers Network Conference at Minnesota State Community and Technical College in Fergus listening to author Leif Enger (of Peace Like a River and So Brave, Young and Handsome) talk about “place” in writing. The Editorial Board of Lake Region Review 2011, after careful consideration, has finalized selections for Lake Region Writers Network’s first literary magazine. While editors and readers were pleased with the number of submissions, the sheer volume of entries also made their choices much more difficult. …not only that, but back in June my husband and I traveled the 200 miles to Fergus Falls to see my winning entry in the spring Roadside Poetry competition splashed across four billboards near the college. 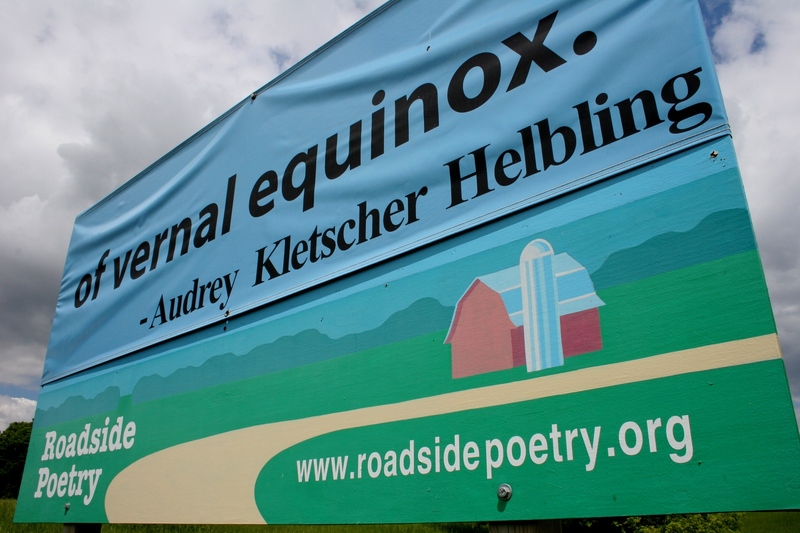 The last of four billboards featuring my Roadside Poetry spring poem. So I’ll wait for the LRWN folks to send me a copy of their literary magazine, which I’m mighty pleased to be a part of because, well, any time you win a highly-competitive contest judged by others of literary talent, it’s an honor. I’LL HAVE TO WAIT until another year also to attend an arts event that’s long been on my list of “things I want to do.” That’s Meander—Upper Minnesota River Art Crawl. Thirty-three art studios featuring the work of 45 artists will be open during a free self-guided tour that begins Friday (2 p.m. – 6 p.m.), continues into Saturday (9 a.m. – 6 p.m.) and ends Sunday (9 a.m.– 4 p.m.). I suspect place, as much as anything, influences the photography, paintings, pottery, fiber art, woodworking and other art created by those artists featured in the Meander. Meander featured artist Kerry Kolke-Bonk of Appleton created the painting, "What goes around comes around," to promote this year's art tour. According to economic impact information I received from Kristi Fernholz, Community Development Planner for the Upper Minnesota Valley Regional Development Commission, the Meander brings in an average of $1,652 in art sales per artist (2010 and 2009 statistics). Last year, art sales during Meander weekend totaled $69,395. In addition, attendees infuse the area with more money spent on food, lodging and other shopping. I won’t be one of those shoppers this year. But you could be. If you have an open schedule this weekend, consider a trip west, as in western Minnesota. FYI: Click here for more information about Meander—Upper Minnesota River Art Crawl. Click here for more information about Roadside Poetry. 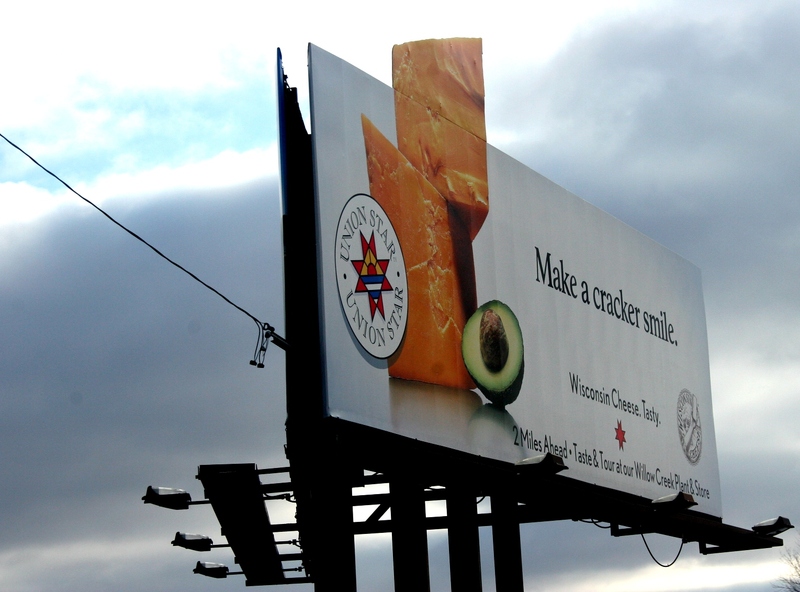 “Did u hear about the anti-cheese billboard up by green bay?” my Wisconsin-resident daughter texted. Since I discovered her message seven hours after she sent it, I was on my own to investigate. You don’t dangle a tidbit of information like that in front of my eyes and expect me to let it go. So here’s the deal, according to information I gleaned in a quick online search. I don’t need to explain. If you want details on the Physicians Committee’s stand, click here. Originally, the billboard featured an image of the Grim Reaper wearing a cheesehead hat. Now he’s hatless, reportedly due to a threatened lawsuit by the company that makes those signature hats. 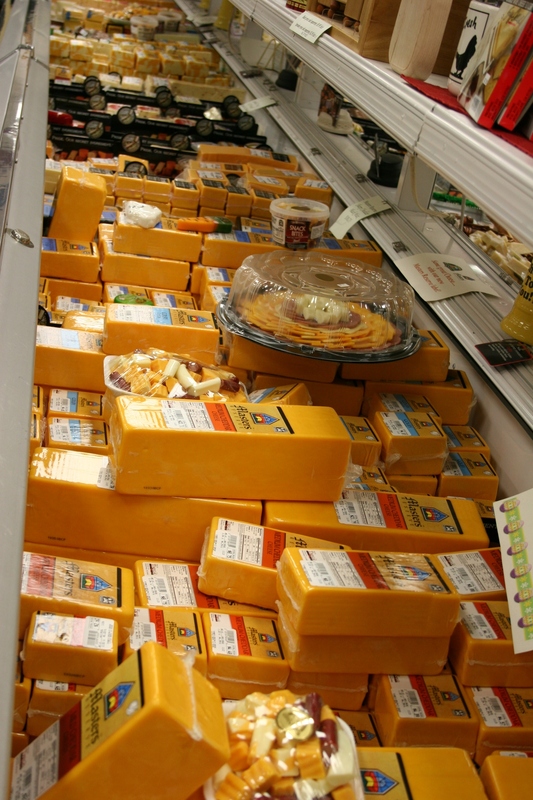 So, that all said, I wonder if the D.C. folks understand, really understand, the importance of cheese in Wisconsin. I’ll take you on a little photographic tour through Wisconsin, showing you images taken within the past 10 months. I expect this isn’t the last we’ll hear of this billboard controversy. And, just for the record, I love cheese. 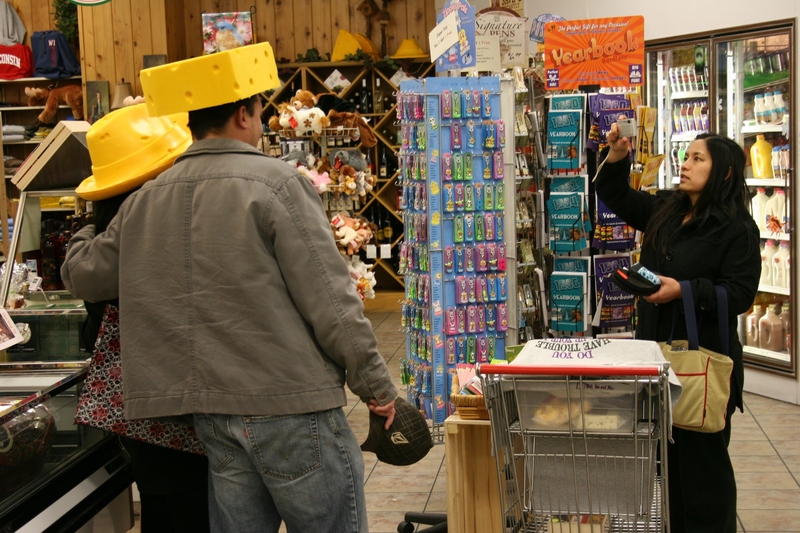 Cheese is a big part of the tourism industry in Wisconsin as evidenced by this photo taken at Simons Specialty Cheese in Little Chute. Yes, those would be the famous cheesehead hats. 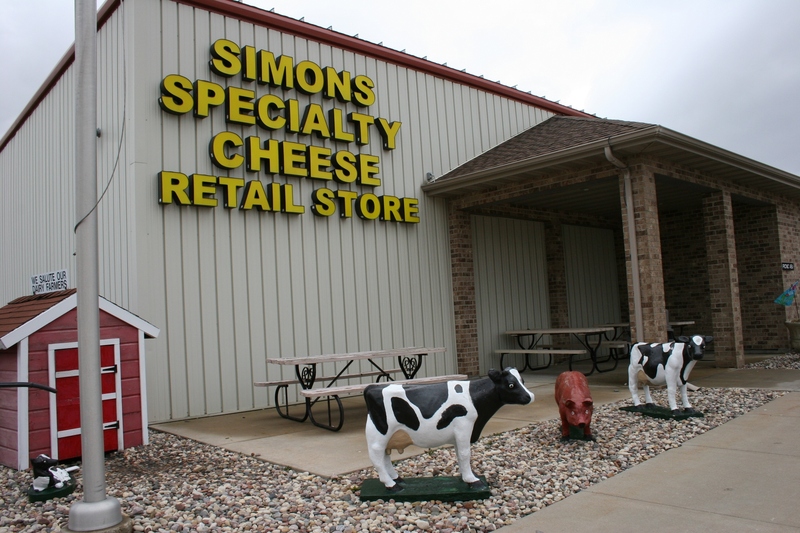 Simons Specialty Cheese is one of the retail outlets for Trega Foods, Ltd., which produces natural curds and mozzarella sticks right next door at its Little Chute plant. 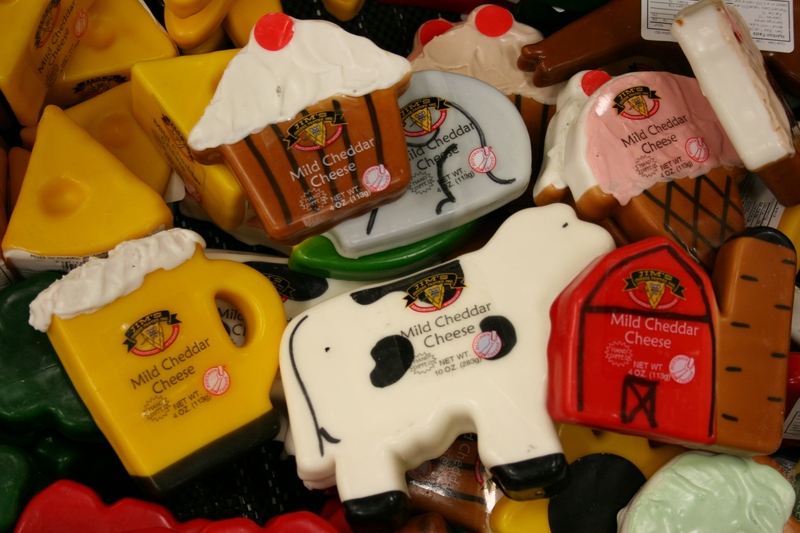 Kitschy cheddar cheese shapes sold in Wisconsin. 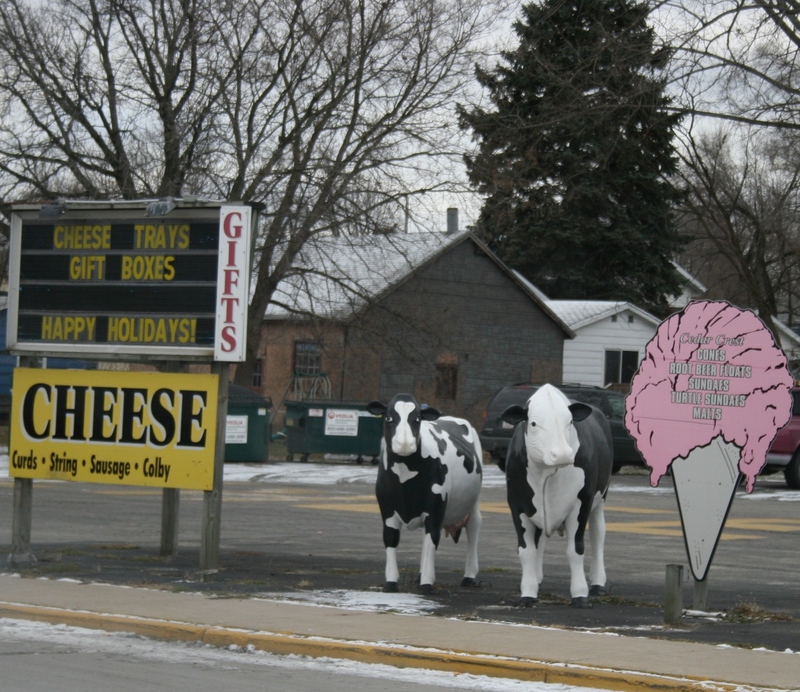 You can't miss these cows and cheese sign along a Wisconsin roadway. A small sampling of the cheeses available at Simon's Specialty Cheese. 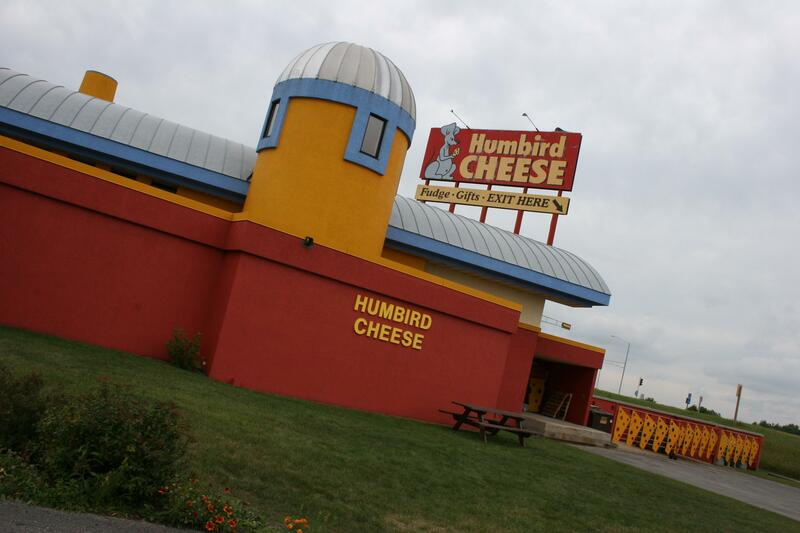 Humbird Cheese, a popular tourist stop at Tomah. Promoting cheese on a billboard along a central Wisconsin highway. SO, WHAT’S YOUR take on the Physicians Committee for Responsible Medicine billboard and/or its stand on cheese? 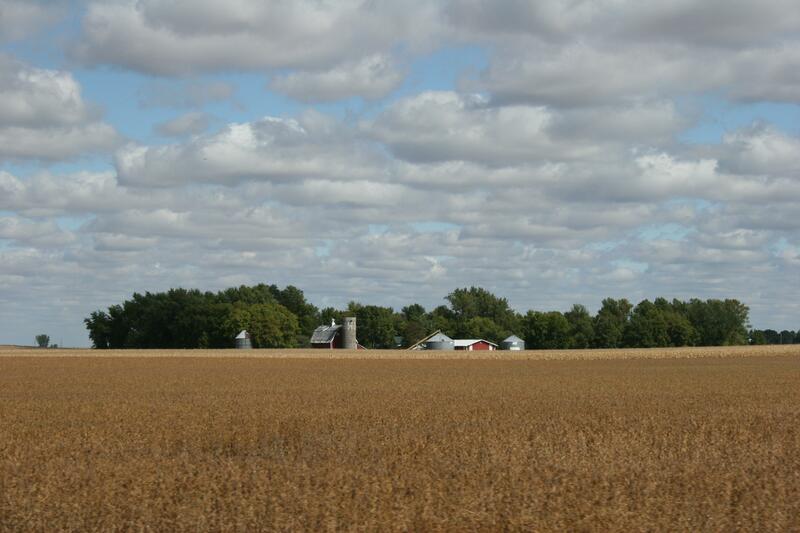 DEEP IN THE RICH FARMLAND of southwestern Minnesota, a group of farmers are planning for harvest. But not their harvest. They will gather to bring in the crops of their friend and neighbor, Steve, who was found dead at the scene of a single-vehicle crash eight days ago. Even before last Friday’s funeral, these good people had lined up half a dozen combines to sweep across Steve’s corn and soybean fields south of Lucan. One day for the corn. One day for the beans. I don’t know the identities of these friends. But I expect they were among the mourners who packed St. John’s Lutheran Church in Redwood Falls on Friday to console a grieving family, to find comfort in Scripture and song and words spoken. I was there. We heard the pastor tell us how God loved Steve so much that he called him home—too early in our eyes, at the age of 64—to spare him from evil and to give him peace. Words that helped us to understand, from a pastor who considered Steve a personal friend, who himself paused to wipe tears from his eyes during his message. As I sat in the balcony, looking down toward the casket, to the family in the front rows, my heart broke. For my youngest brother who had stretched his arms along the back of the pew to encircle his wife and their teenaged daughter and their son. They had lost their father, father-in-law and grandpa. And later, at the cemetery, as my dear sister-in-law leaned forward in her chair, her head bent, her hands clasped tight in her lap, my heart broke. Minutes later I pulled my 11-year-old nephew close as tears slid down his cheeks, as his body shook with sobs of grief. I wrapped him in my arms, stroked the back of his head, wished with all my might that I could make everything better for the boy who loved his “Papa” so much. Later, in the church basement, we found moments of laughter in the stories shared by Steve’s oldest son about the perfectionist farmer who each morning walked out of his farmhouse and checked to see that everything was in its place in the farmyard. We laughed at the man who spent one final weekend with his family, arriving at a downtown Minneapolis hotel with a small bag, asking to, once again, borrow his other son’s shaver. It felt good to laugh through the tears, to hear about the grandfather who kept cats because he knew his grandchildren loved them, who got a lamb because he knew his grandchildren would love that lamb. We laughed and remembered and celebrated the life of a man who was dear to so many. 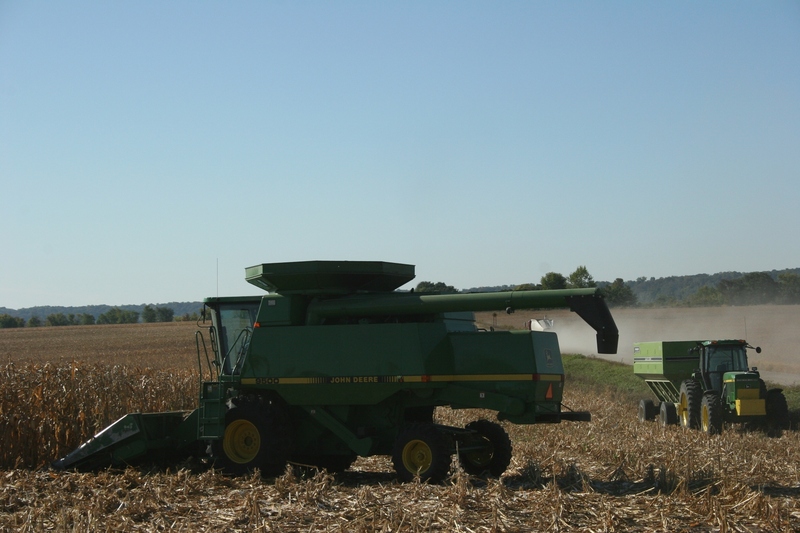 When Steve’s farmer-friends roll their combines onto his acreage, they’ll pay him one last tribute—by bringing in the final harvest. NOTE: The above combine photo is for illustration purposes only and was shot just outside of Courtland on Saturday morning. 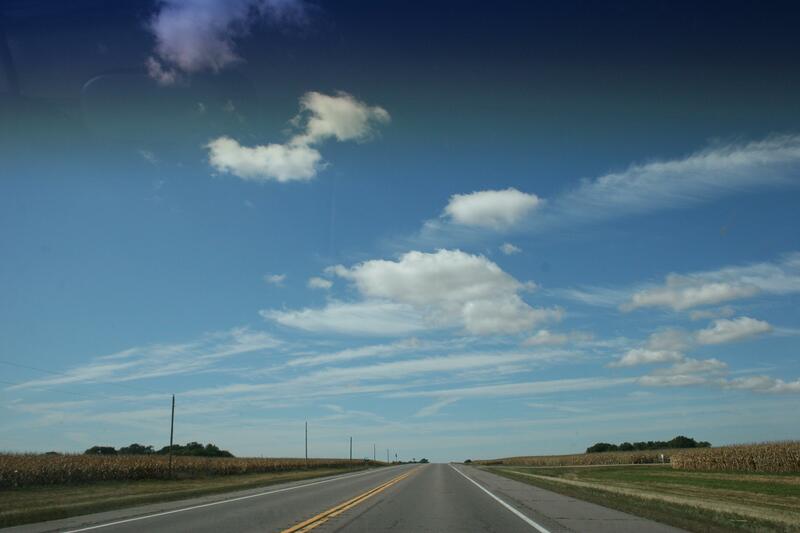 Westbound on U.S. Highway 14 between Nicollet and Courtland in southern Minnesota Friday afternoon. I LOVE THIS LAND, this rural southern Minnesota. You can take your woods and your lakes and your boats or your big city freeways and skyscrapers and traffic jams. I will take sky and a land that stretches flat into forever. I like my space open, not hemmed in by trees packed tight in a forest. I want to see into forever and beyond, the horizon broken only by the occasional grove hugging a building site. 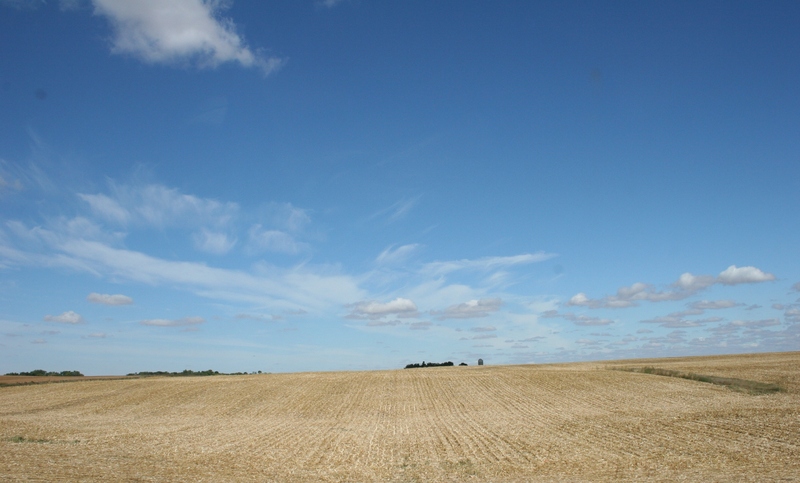 A farm site between Mankato and Nicollet, as seen from U.S. Highway 14. 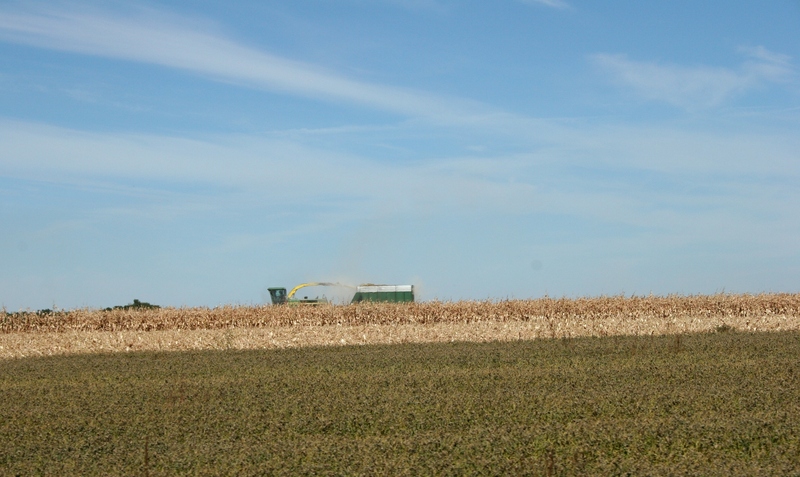 A harvested corn field between Nicollet and Courtland. I want corn and soybean fields ripening to the earthy hues of harvest. Not gray cement or dark woods. 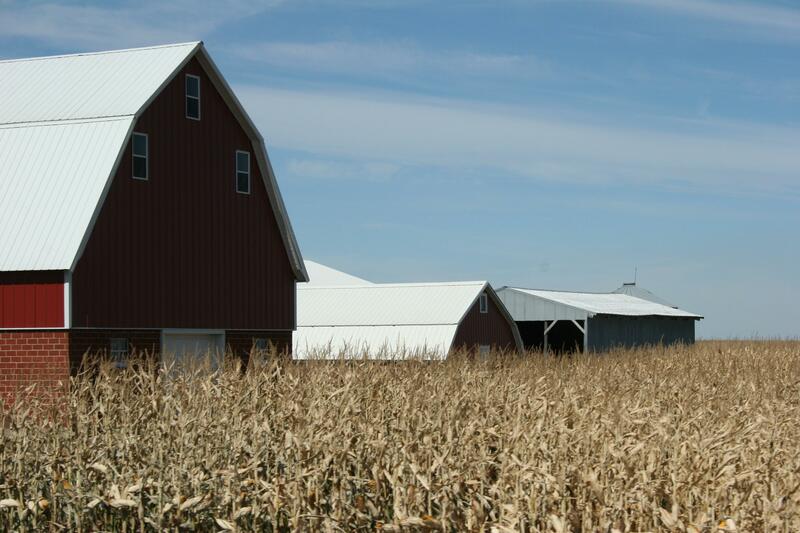 Give me small-town grain elevators and red barns and tractors, and combines sweeping across the earth. 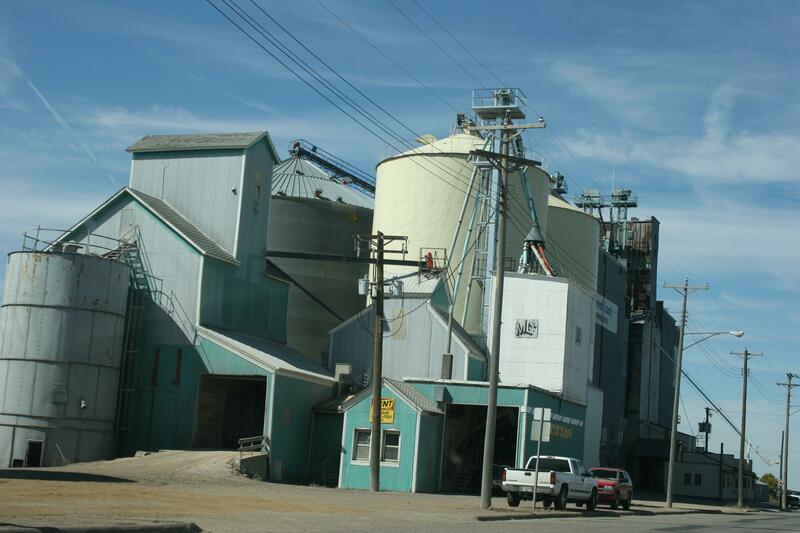 The elevator complex in Morgan in Redwood County. 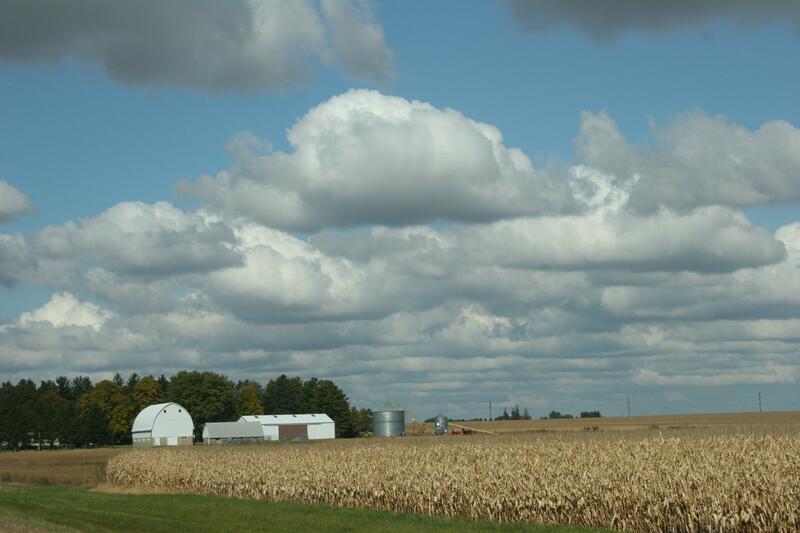 A farm site along the twisting back county road between New Ulm and Morgan. 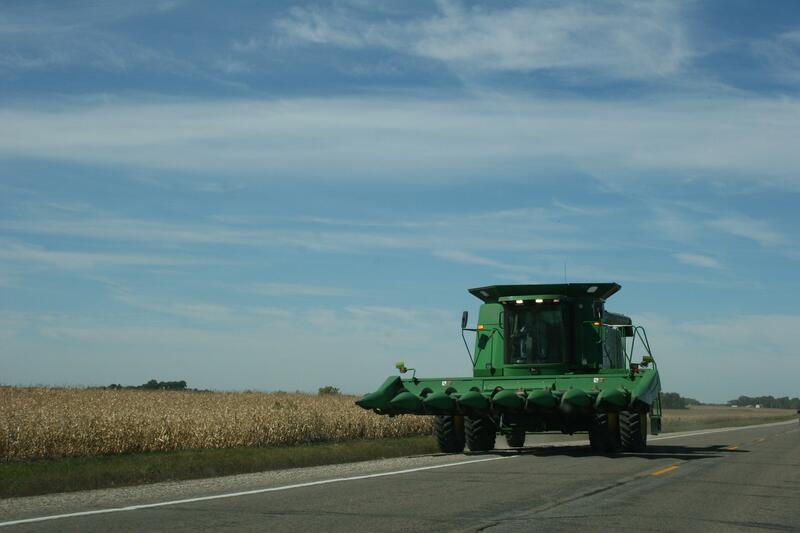 A John Deere combine spotted on the highway just outside of Morgan. This is my land, the place of my heart. Although I left the farm decades ago, I still yearn, during autumn, to return there—to immerse myself in the sights and smells and sounds of harvest. The scent of drying corn husks. The roar of combines and tractors. The walk across the farm yard on a crisp autumn night under a moon that casts ghost shadows. Wagons brimming with golden kernels of corn. Stubble and black earth, turned by the blades of a plow. Today I only glimpse the harvest from afar, as a passerby. Remembering. 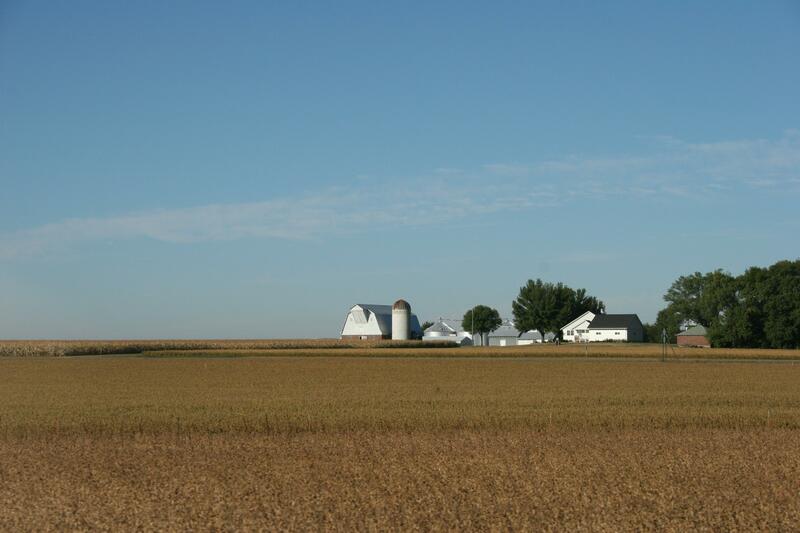 A farm site between Morgan and Redwood Falls in southwestern Minnesota. 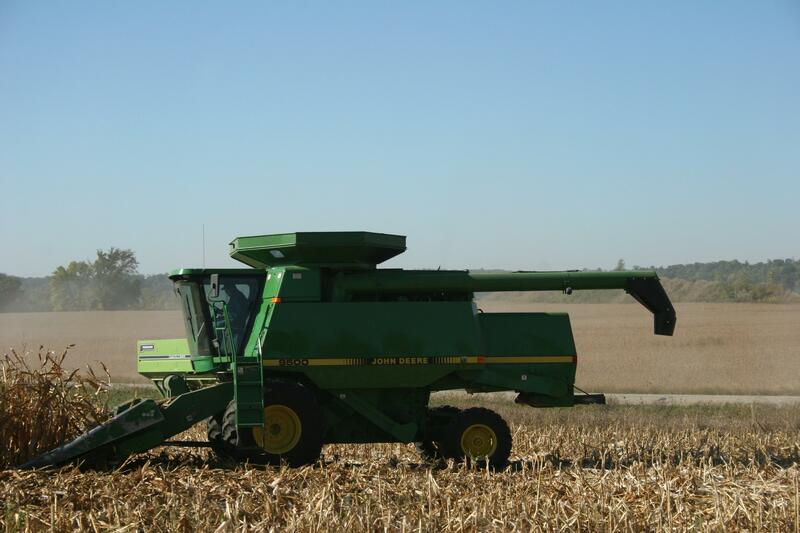 Harvesting corn on Saturday just outside of Courtland. Chopping corn into silage between New Ulm and Morgan. ALL OF THESE IMAGES (except the elevator) were taken at highway speed from the passenger side of our family car while traveling through southern Minnesota on Friday and Saturday. 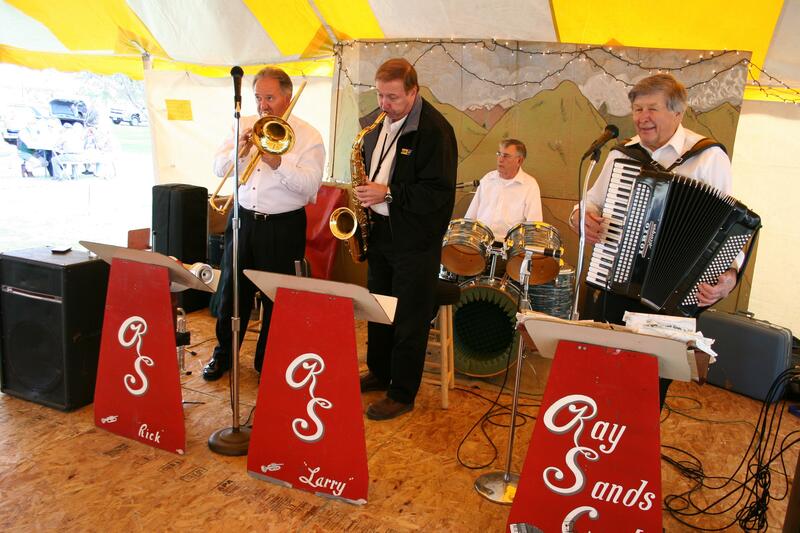 The Ray Sands Band played from 1 - 3 p.m. under the tent at Germanfest. Above the plaintive baaing of a goat in the petting zoo, the old-time band pumped out the polka which isn’t about pie at all, but about love. And so, under the tent, the bands played—Tim Chlan and Friends, The Ray Sands Band and The Stuttgart Three—at St. John’s United Church of Christ’s annual Germanfest in Wheeling Township near Nerstrand Big Woods State Park. 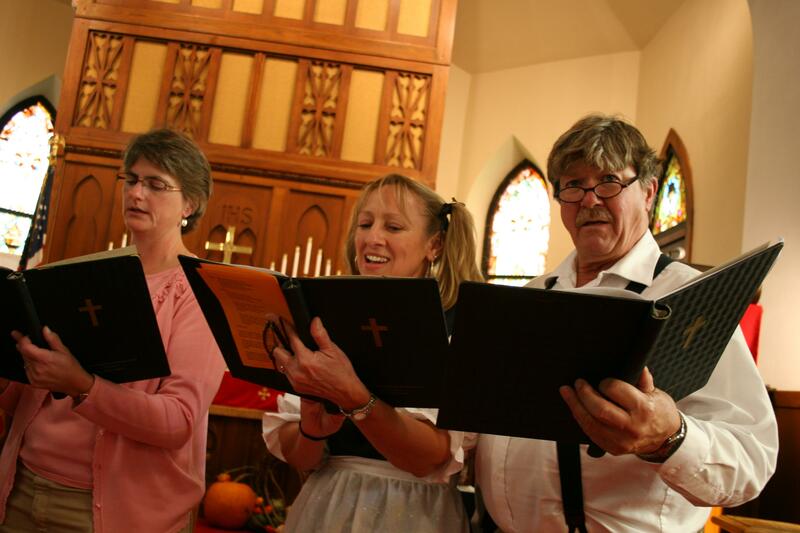 The Stuttgart Three from Rochester led the polka praise service inside St. John's sanctuary. A musical quartet presented "Cleanse Me" and "Reach Out to Jesus" during the praise service. Afterward we broke bread in the fellowship hall over a German buffet. Sauerkraut and sauerbraten. Brats. Rinderwurst and beets and green beans with bacon. Vinegar-laced German potato salad and mashed potatoes and more foods than I can remember. Homemade. Three hundred pounds of potatoes peeled. Nearly 60 dozen brats boiled and grilled. Bread pudding made from grandma’s recipe. Good, hearty food that tasted of the Mother Land. 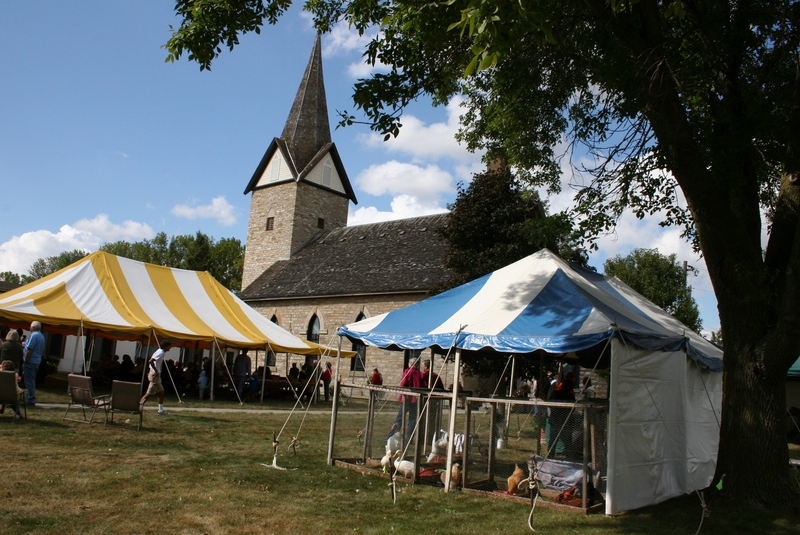 It didn’t matter whether you were Deutsch or Dutch, Lutheran or Catholic or a long-time church member, whether a first-time attendee from Centerville or Faribault or a faithful former member from Blooming Prairie, you enjoyed, simply enjoyed, the hospitality of this congregation. 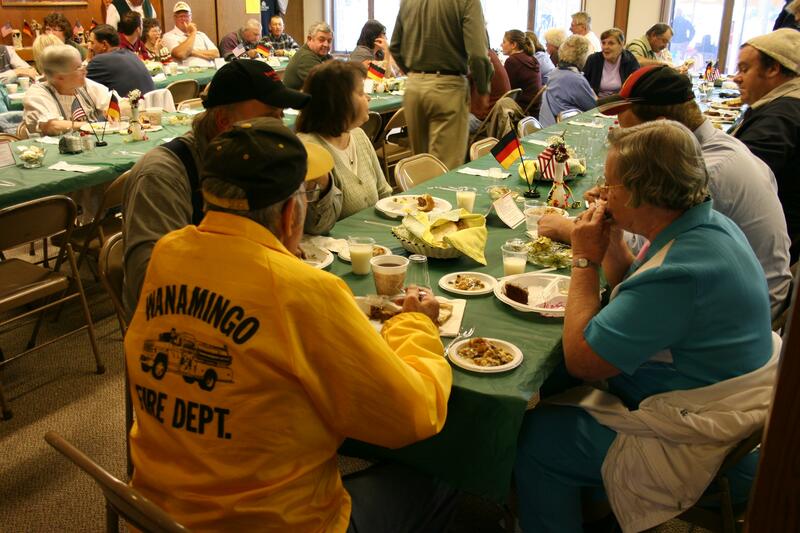 Diners enjoyed a German buffet in the fellowship hall before and after the praise service. Deutsche food: German potato salad, red cabbage, sauerbraten, rinderwurst, a brat, sauerkraut, beets and green beans on my plate. 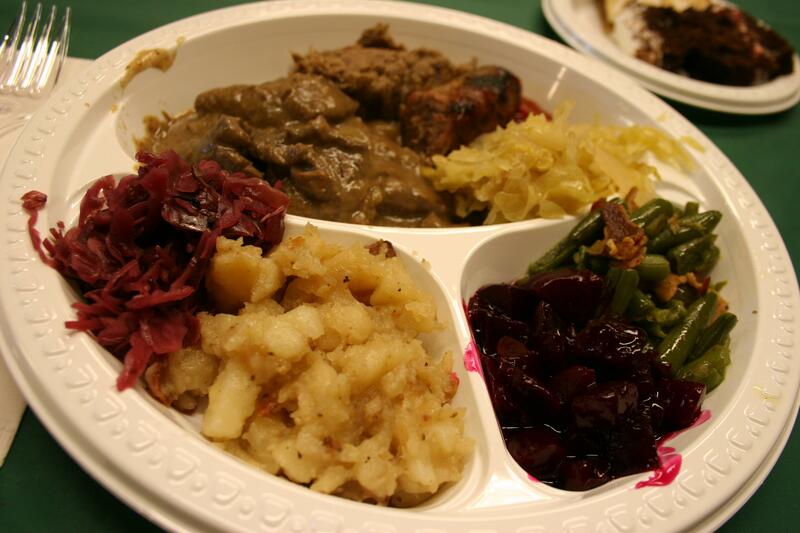 Volunteers kept the buffet trays filled with delicious homemade German foods. Bingo and a quilt show. Geese and ponies and goats and birds in a petting zoo. Woodcarvings at the silent auction. Homebaked goods in the country store. Jars of apple jelly, glistening like gems in the sun. All of it, together, creating a memorable afternoon at this country church set among the flat corn and soybean fields of eastern Rice County. 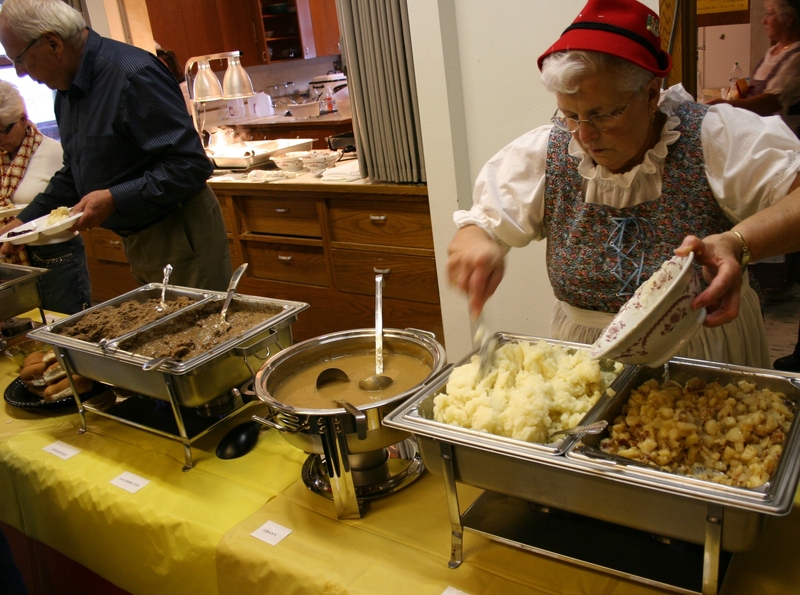 This is the season of church festivals and dinners—of lutefisk and Swedish meatballs and ham and of vegetables dug from the earth. It is a time to gather close, to remember the homeland from whence we came, to celebrate our heritage, to rejoice in the harvest. 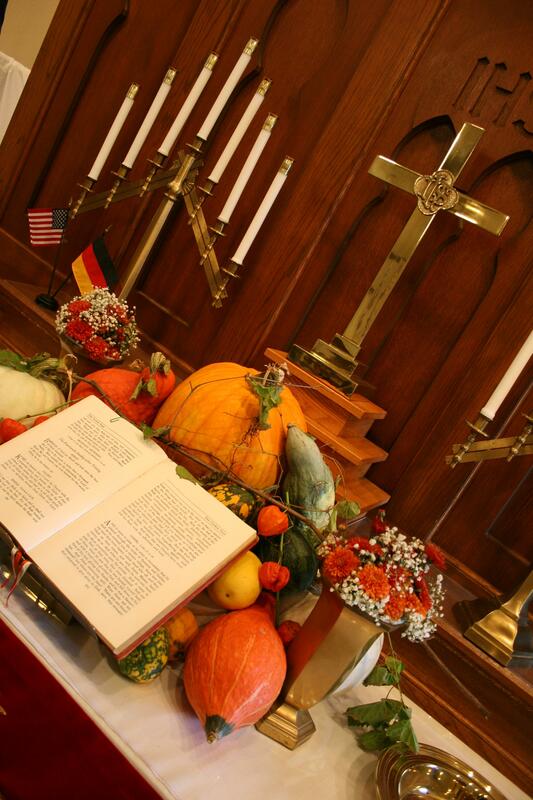 The sanctuary was decorated throughout with harvest vignettes, including this one on the altar. 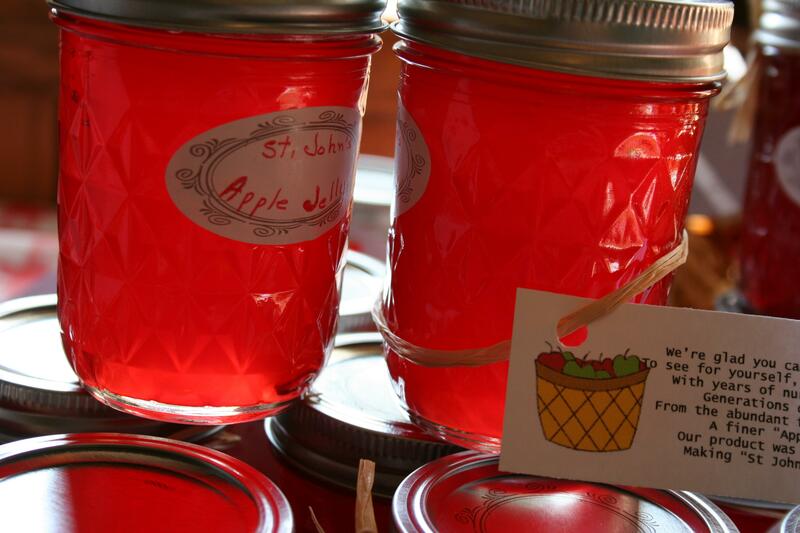 St. John's members make apple jelly and apple butter from fruit growing on an apple tree in the churchyard. 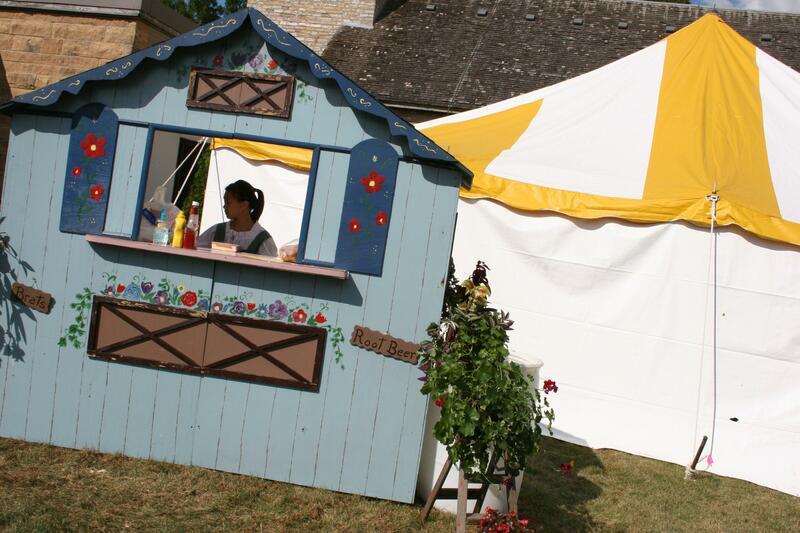 The jelly and butter are sold at the festival. 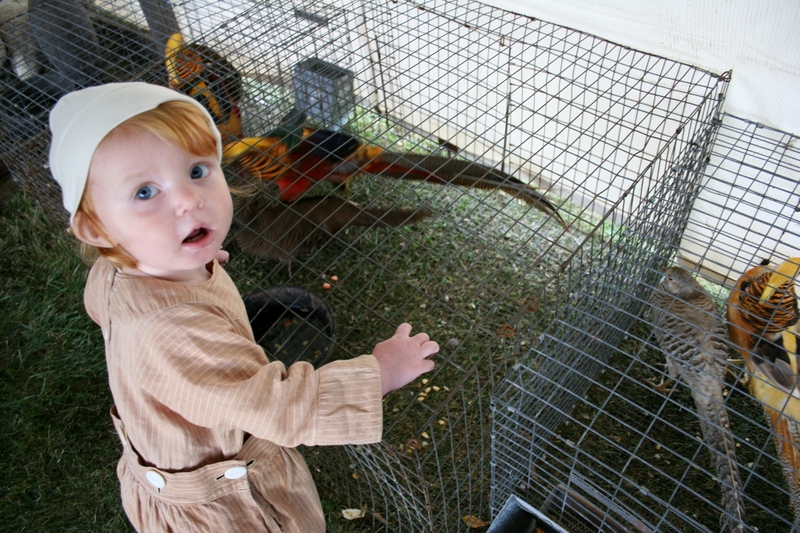 Juniper, 15 months, enjoyed the birds and animals at the petting zoo. 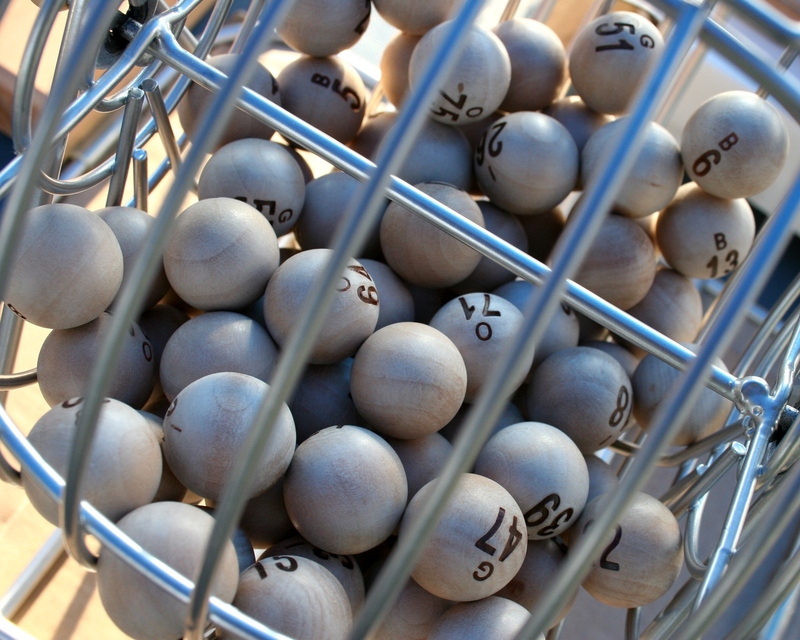 As is typical of most church festivals, attendees could play bingo outside under a tent. 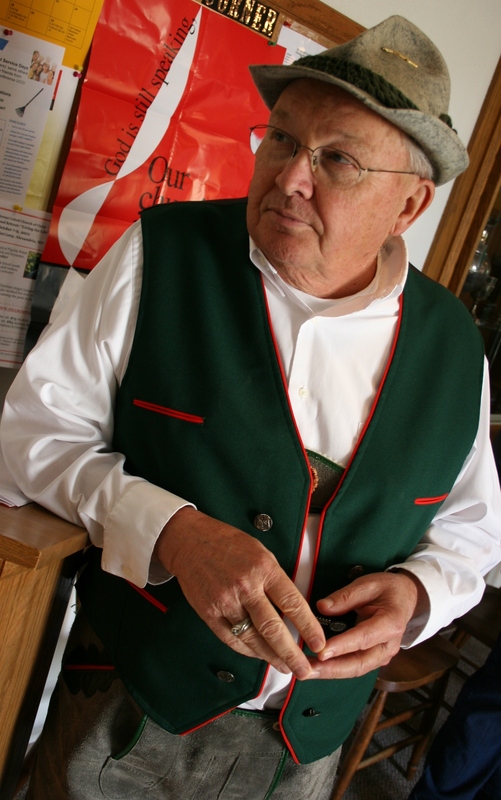 Many of the volunteer workers dressed in German costumes. 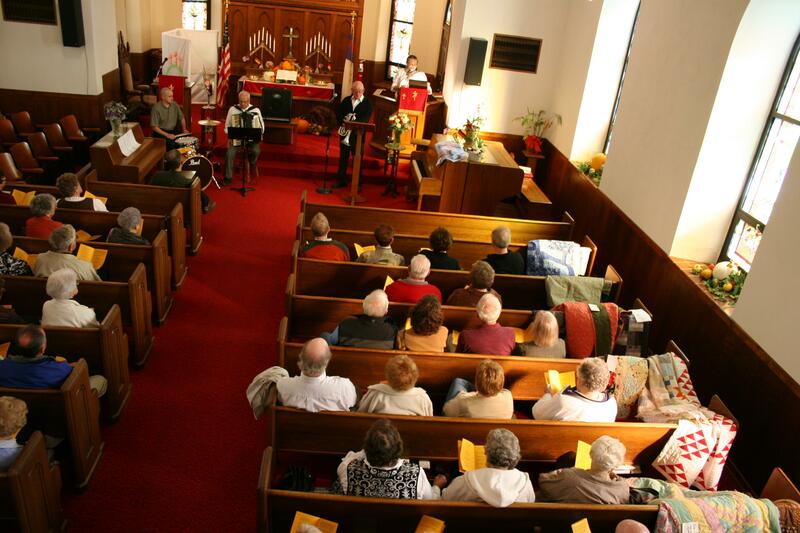 Each member of St. John's was asked to bring a quilt for the quilt show in the sanctuary. 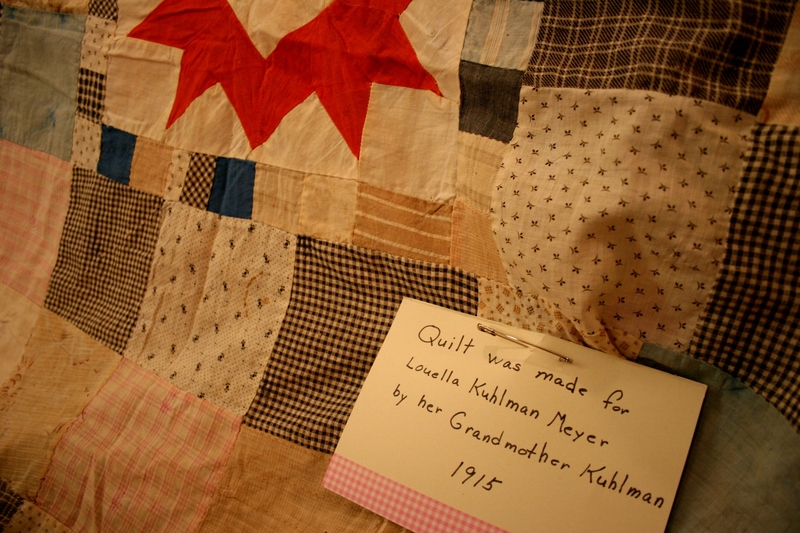 Quilts were draped over pews with brief information attached to each. 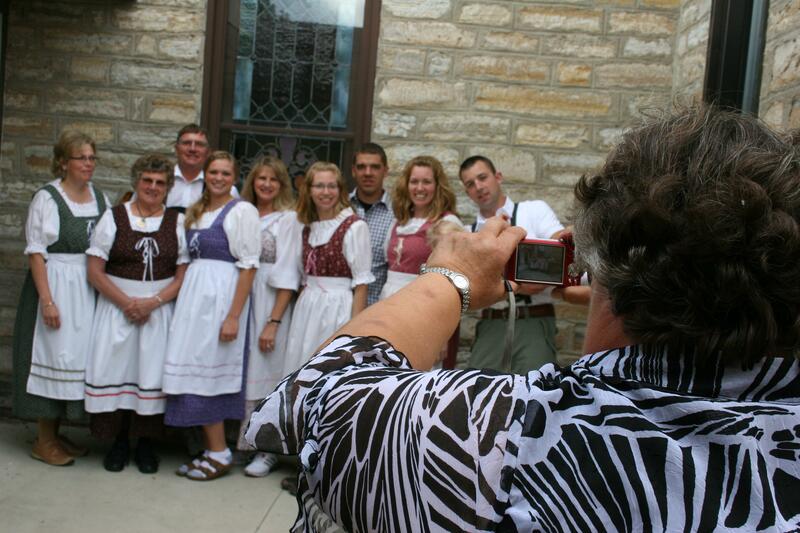 The Bultman family poses for a photo outside the stone church. The brat and root beer stand next to the music tent. The festival grounds at St. John's U.C.C., Wheeling Township. DO YOU ATTEND CHURCH dinners or festivals? If you have or know of an upcoming must-attend dinner, submit a comment. I’d like to hear about it. ALSO, CHECK BACK for more photos from Germanfest.